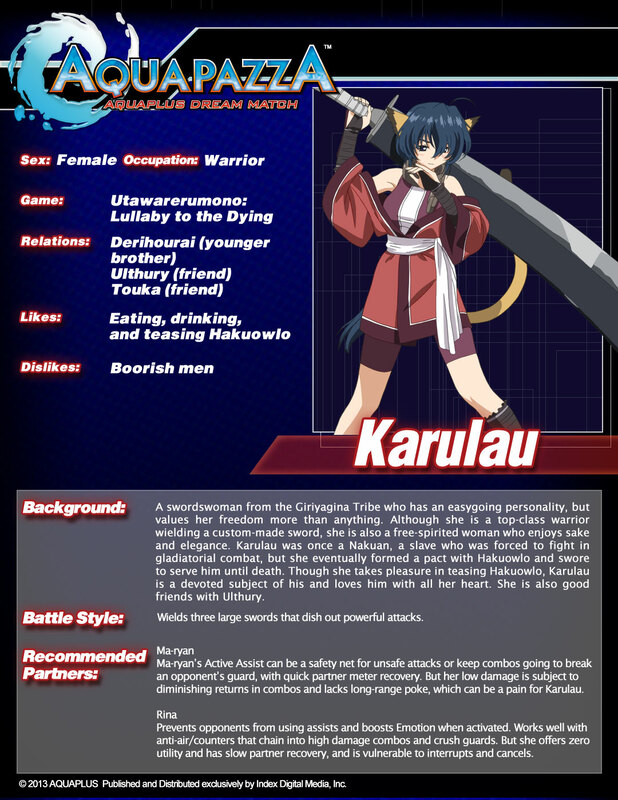 Atlus has started releasing character bios for its upcoming fighting game, AquaPazza. It comes out for PlayStation 3 on November 22, and features characters from various dating sim titles. I was concerned that players wouldn’t know who these characters were. Although we have some character bios here that have been released by Atlus, I took a look and thought: “I can do better.” I started writing some vignettes for each of the characters that may or may not be canonically accurate. None of this is approved or endorsed by Atlus in any way, but I hope they think it’s cool and stuff. The white-haired man being addressed leaned back in his chair and rested his head in his interlocked hands, behind him. He had been kept here in this featureless room for hours without directly being told why. He didn’t need to be told, though. After waking from a thousand-year slumber, there were bound to be societal changes. That’s okay; he’d change things soon enough. He had the power, but there is a time and a place to properly apply power. This wasn’t the place. He was going to play along. “Yes, I understand, but I don’t see the problem. I’m not harming anyone,” he said to no one in particular, especially not the guy with his hands slammed down on the table across from him. Arawn had six wives. If you take the first letters of each of their names, it spells RMLOER. That doesn’t mean anything, by the way. It doesn’t even spell anything coherent. What are you, stupid? But here Arawn was, in custody by the authorities of the government. All because of his lifestyle choices. Choices which were totally acceptable one thousand years ago. Arawn could smash the puny fool in front of him with no effort. This miscreant in front of him who thought he had power; he’d show him what power was. But this was sucker’s game; if he did that, the groundswell of popular opinion would turn against him. It might be better to be feared than loved, if one had to choose between the two. Arawn couldn’t risk any challenges to his authority at this point. As the sycophant shouted and screamed at him, flecking spittle onto him, Arawn thought of what he could do. He would win the AquaPazza. With the popularity and glory that came with it, he’d have the public’s love. Their adoration. Only then could he push forth with his new order. It would just be like the old order, and everyone would love him. 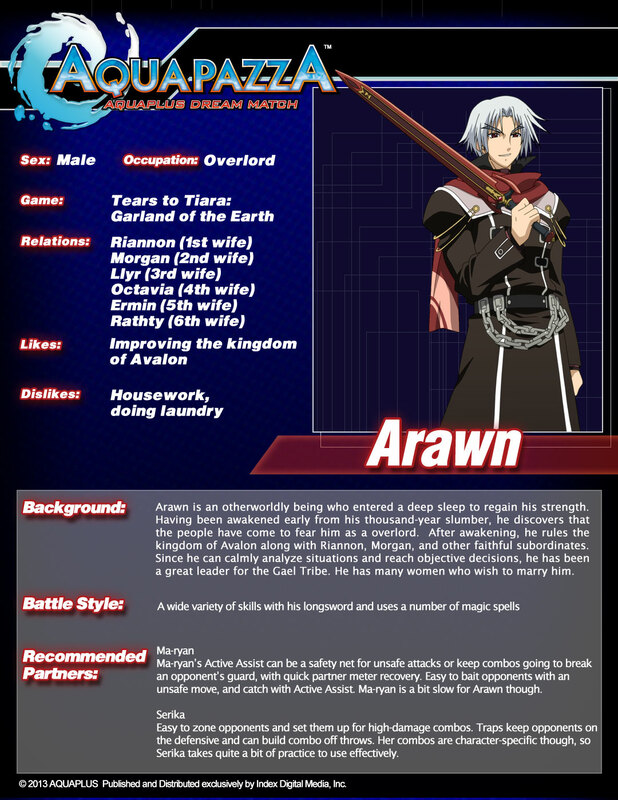 And he’d be free to have six wives, for whatever reason that Arawn has six wives. My name is Karulau. I was borne witness to the horrors of meaningless combat for the enjoyment of the elite of society. Now I am free, and I bear witness to the only truth in this universe: My own happiness. Hedonism is a state of mind, you see. Don’t look at me like it’s a naughty word. It’s very simple, actually. Live for the moment. Live for yourself! Enjoy glorious food, and wine… and the company of others. Hey, I know what it’s like to be moments away from death. Moments away from the end of a life that had no meaning and no goals. Now I have these things, and I cherish them. I will never take them for granted. I want to love and be loved, and experience new and dizzying heights of this realm of consciousness! We only have so much time before it’s all over. Why have any regrets? I want the end of my life to come with complete exhaustion, finally having run out of things to do. What a beautiful, shining moment that will be. …why am I fighting in the tournament? For hedonism? Pffffft. Hell no. You see these swords, son? I got three of them. Look, it says it in “Battle Style” in the picture up there. But hell with that. I need more. If I win, I’m gonna go buy more swords. I swear to God I’m going to fight with, like five swords. Or six. I do not even care. Swords in swords. You name it. Let’s do it. Maybe I’ll throw swords. I want to have swords for days. Without looking up, Kusugawa addresses her student council companion. “Not until everything is done.” Forms upon forms are stacked upon another. Kusugawa’s deft right hand signs and fills them out with a flourish, and places them in an ever growing pile. Even so, it seems like she may never finish. This response gives the subordinate pause, but she eventually recovers and asks the question that’s really been on your mind. “R-really?” stammers the subordinate. Kusugawa closes her eyes knowingly, leans in, and then I end this story because I need to come up with reasons why each of these characters are fighting, but with this one, we really need to figure out why she’s even wearing that outfit. I mean, look at that. 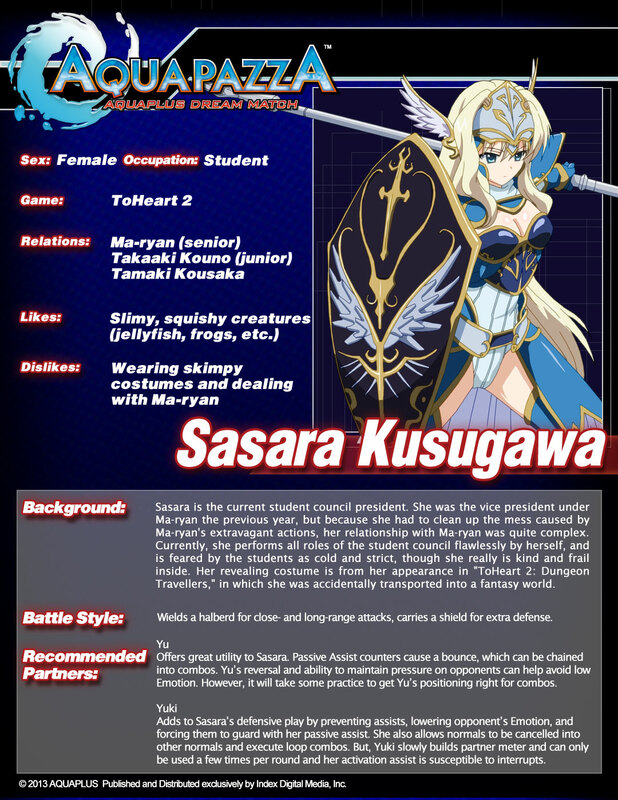 We’ll have more stories for the AquaPazza cast as Atlus releases more character bios. I have to admit the game looks really nice in screenshots, and I will be reviewing this game on or around its release date.